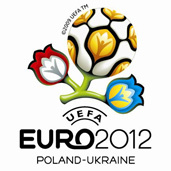 Tickets for Euro 2012 matches in Ukraine and Poland playedfrom June 8 until July 1 will cost from 30 to 600 euros. “The purchasing power of local citizens was taken into account when setting prices, and the cheapest tickets will cost 50% less than at UEFA’s Euro 2008 [event] in Austria and Switzerland. Furthermore, tickets for the final in category 3 will cost EUR 50 only,” reads a posting on the Web site of UEFA. The tickets for the opening match will cost EUR 45-250, tickets for group matches will cost EUR 30-120, and a ticket for the final will cost EUR 50-600. There will be several types of tickets available: individual match tickets, venue, group, or knockout stage tickets, as well as “follow my team” and play-off tickets. The posting also reads that UEFA, the Polish and Ukrainian football federations and the local organizing committees have put in place a transparent and fair ticketing policy with the aim of offering affordable prices for all matches of the Euro 2012 Championship.